After Cop-15 it seems a good time for some debate about political strategies…when old patterns have broken down it’s time to plot some alternatives and see what these different strands can pull together. It has been agreed environmental issues need to considered much more into a coherent critique of capitalism, which we believe is the main reason why ecological crisis’s and destruction occur. We felt that, despite Copenhagen having been being painted as a mass gathering of radical movements; which had risen phoenix like from the ashes of the no-global, anti-capitalist movement; learning from Seattle, Genova and summit-hopping. The reality turned out to be a hollow shell: grand call outs to bring activists from all over Europe on the dreams of grandiose slogans: ‘hit the production’, day of action! ‘Reclaim Power’. There was a lot of hope invested in the so-called ‘affinity groups’ who were going to emerge and carry out actions around town, cross police lines, confound the police etc. When the moment came the police were a lot more organized and prepared than any of us had imagined. High levels of repression bankrolled by the Danish state who didn’t want anyone or anything to tarnish their moment on the global political stage criminalized much of the movement. Pre-emptive arrests, mass arrests (more than 2,000 protesters arrested) targeting of the ‘leaders’ – spoke-persons (basically anyone who spoke in public or went near a megaphone) found us disorganized, fragmented and with a lot of mis-communication to resolve.This leads to our first consideration: in this system of high level control, is there any point in still going to counter-summits? We didn’t talk too much about what happened specifically in Copenhagen (fortunately); the focus was instead on the importance of networking as a tactic to keep and enlarge the community to carry out the struggle. Act locally seems now a must, big gatherings and summits represent an important way to meet up with similar and different people in a global level which often gives enthusiasm but police control and repression is too high to contribute significantly to shut down g8s, COPs, g20s and so on. It has been reported in the past, as well as in the present, new tactics have always been successful to create a common imaginary of creativity and bring new and more people to join the struggle. In this contest, it has been point out the importance of creating communities around us to have even more people involved and being able to act. We think new contents and tactics are desperately needed and it’s definitely by not turning our consumption into an ethical green-shop that the world can be saved. There is a lot of focus on the personal lifestyle but we felt individual choices (whilst no doubt important) cannot replace political action and it is not though recycling and buying organic or fair trade products that economic system and system of productions will be challenged and changed. There is also a reflexive critique of many protagonists in the movement who stress ‘lifestyle’ and personal choices as their power of impact. Jensen in Dealing with Distractions puts it succinctly: “the role of an activist is not to navigate system of oppressive power with as much integrity as possible, but rather to confront and take down those system”. To conclude, we want to restate the futility of these false solutions proposed if they don’t first consider shutting down and struggling against this capitalistic system. However, there’s issues still open: how to channel all the anger and frustration felt by many people regarding what to do next. This will be discussed in the next meeting 3rd February at 7pm. After Cop-15 it seems a good time for some debate about political strategy… when old patterns have broken down it’s time to plot some alternatives and see what these different strands can pull together. 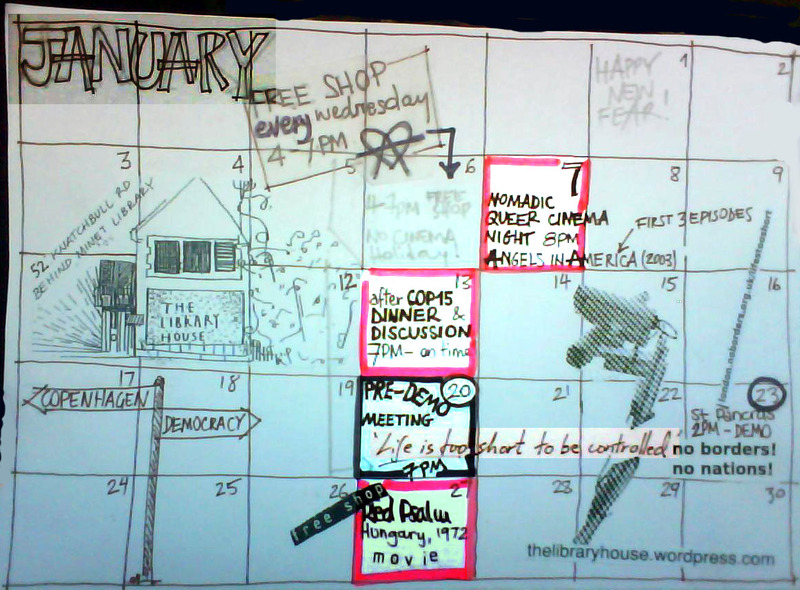 Next Wed (13th) the Library House is kindly hosting an informal dinner/discussion regarding the successes and failures of COP-15, the Global Justice movement and where to go from here. If you have some frustrations to vent, beautiful experiences to share, incisive analysis to contribute or sudden illuminations that need expressing come and show your face! After eviction Non-Commercial House abandons its old self, and flutters across London, to become something else in different spaces. Films are on the first Thursday of every month from 8 PM. The next film night will be at Library House where we will screen the first three episodes of Angels in America. Angels in America (2003, 176 min), first 3 episodes: Playwright Tony Kushner adapts eir political epic about the AIDS crisis during the mid-eighties, around a group of separate but connected individuals. incisive analysis to contribute or sudden illuminations that need expressing come and show your face! Is your house clogging up with stuff you actually dont need? Bring it to the Freeshop and sure you will make other people happy with it. The Freeshop is not based on the ‘swopping-principle’ so you can both come to only bring stuff or collect stuff or both…. The Freeshop is for everyone! WEDN/13/JAN/AFTER COP-EHNAGEN DINNER & DISCUSSION//The idea is to have dinner (on a shared basis, we cook nice vegan food you bring drinks) to make a point on what Cop-enhagen meant; is it true it represented the turning phase of the movement? and what about contents and tactics? We want to have a broad but critical approach, everyone is welcomed to come along and have a say. WEDN/27/JAN/RED PSALM (Még kér a nép)// Hungary	1972. Director: Miklós Jancsó, Red Psalm is centred on a specific period in Hungarian history: the turn-of-the-century uprising of landless agricultural workers. A work of amazing and totally uncosmetic beauty.